In a small coastal village in New Zealand, a woman is about to give birth to twins. One will be the heir of Paikea, the mythical whale rider and the Maori community’s hope for the future. The other is a girl. When the mother and her baby son die during the birth, grieving father Porourangi (Cliff Curtis) names his daughter Paikea - much to his own father, Chief Koro’s (Rawiri Paratene), disgust. Devastated, Porourangi leaves Pai (Keisha Castle-Hughes) to be raised by her grandparents. While Koro grows to love Pai, he cannot accept that she is now the inheritor of their tradition and claims that she is of no use to him. However, deep within herself, Pai knows differently and sets out to prove herself to her grandfather and her tribe. It is all too easy to get carried away by new films. While there is an undeniable buzz around the latest, shiny cinema release, it is also so exciting to find an older film that you may have missed. The latter was my experience of writer/director Niki Caro's 2002 film, Whale Rider. On its release, this movie was well received by audiences and critics alike (Roger Ebert called it fresh, observant, tough and genuinely moving) and made an overnight star of young actress, Keisha Castle-Hughes. I watched Whale Rider as part of my women in film season (see Random Observations below for more information). As a result, I didn’t know quite what to expect. All I knew was that it was about a young Maori girl who believes that she can become a leader of her tribe (and that a whale would be involved at some point). I did not expect to be swept away in such a magical, emotional tale. 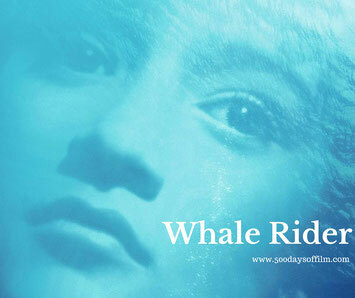 Whale Rider was inspired by the novel (of the same name) by author, Witi Ihimaera. It tells a truly uplifting and inspiring story. Pai dares to dream that, despite her father’s absence and her brother’s death, she can fulfill her destiny and become the true heir to the whale rider. She knows that she has much to learn and we feel her frustration when she is denied opportunities and training because she is a girl. Despite this and in the face of crippling rejection and loss, Pai lets nothing stand in her way. She is brave, always true to herself and, thanks to a superb performance from Castle-Hughes, she is wonderful to watch. Whale Rider is a powerful film, beautifully shot and featuring impressive performances from its cast. The film’s final act is astonishing - magical, emotional and uplifting. I would highly recommend the experience. I have set myself a challenge (within my original 500 Days Of Film challenge) to spend four weeks watching only those films that have been directed by female directors. Keisha Castle-Hughes was selected from among several hundred children in Mt. Wellington, New Zealand to star as Pai. She was nominated for a best actress Oscar for her performance - at the time, she was the youngest actress ever to be nominated. Have you seen Whale Rider? If you have, what did you think of this film? I would be so interested to know - why not leave me a comment in the box below?